The D.C. area continues to recover in the wake of giant storm Sandy, as authorities in Maryland, Virginia and the District took a new look at how many deaths could be attributed to the storm. That number might be as high as 11 in Maryland, emergency officials said Thursday. However, the medical examiner must make the final determinations in each of the cases, which could take several days. Some of the deaths may be found to have other, non storm-related causes. Meanwhile, power outages in the region have been steadily declining and are down to fewer than two thousand -- a massive drop from 250,000 at mid-day Tuesday. Northern Virginia was hit worst; about 1,600 customers there were still waiting for their power to be restored as of Thursday morning. "It's very hard to find things in the dark," said a resident of an Arlington high-rise, who has to walk six flights to her apartment. 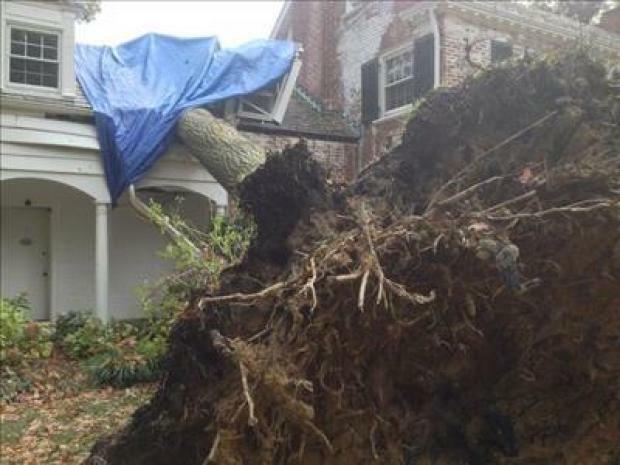 CLICK HERE for photos of storm damage in D.C.
Pepco customers have fared better; the power company released a statement Wednesday night that all their storm-related power outages had been restored. Pepco says it has restored power to 130,000 customers since the storm hit Monday afternoon, and the vast majority had power by Tuesday evening. Unlike the sharp criticism Pepco received in the wake of June 29's derecho storm, this time around the power company has received praise on its relatively quick ability to restore power. Customers took to Twitter to praise the utility, often with a sense of irony. "Power is still on. Thinking of those without. Thank you Pepco! #wordsneverbeforesaid," wrote local resident Daniel Serwer. Residents of Old Town Alexandria say they've experienced worse flooding with other storms -- but dozens of streets were still closed Tuesday. "Praise to Pepco .. lost power about 9:40pm it came back on about 3:30am," wrote another who identified herself on Twitter as Kicha. "I was expecting to be in the dark for days. Very happy pep fan." Current outages are a fraction of the 1.5 million outages experienced during the fast-moving summer storm that caught the region off-guard. This time, Pepco and other utilities had time to mobilize before Sandy hit Sunday night. Across the D.C. area, the storm knocked trees and large branches across roadways, into homes, onto cars and onto power lines. An apartment building on Kenmore Avenue in Alexandria was condemned after its roof was torn open by strong winds. Alexandria spokesman Tony Castrilli says about 20 people in a garden-style apartment building on Kenmore Avenue were evacuated when the roof was damaged by the wind. The building was condemned, and residents all found places to stay. Many homes in Alexandria have tree damage. About 11,000 Alexandria residents are without power. But Castrilli says the city's infrastructure and historic sites were in good condition after the storm. "The winds were strong, but everything seems to be OK. We lost a big tree here, but we're OK," said a resident. In Oxon Hill, Md., a single tree smashed nine cars. In Rock Creek Park, a tree fell onto a park stable while it was occupied by a park officer and four horses; all were rescued safely. The “A” from USA Today's sign at headquarters in McLean, Va., was knocked down by Sandy Monday afternoon. It fell to the lawn, but no one was injured, a spokeswoman said. The storm stretched across the D.C. area and well into communities north, with hurricane-force winds extending outward up to 175 miles. As Sandy moved away, high water filled low-lying streets from Maryland to Northern Virginia, including in Old Town Alexandria, where several streets were shut down as the Potomac swelled over its banks Tuesday. On Wednesday night, though, trick-or-treaters were out in full force there -- with hardly a puddle in sight. The streets were blocked off not for floodwaters, but for families to celebrate safely. Between 4 and 7 inches of rain fell in the D.C. area during the storm. In Leesburg,Va., Goose Creek was almost 10 feet above flood stage Tuesday. Frederick, Md.’s Monocacy River was about six feet over, and Opequon Creek near Martinsburg, W.V., was nearly five feet over. On Tuesday, a kayaker had to be rescued from Seneca Creek in Darnestown, Md. when the storm-tossed rapids became too strong. Flood waters peaked Wednesday and have receded since then. It could have been worse. Due to the direction Sandy was moving, winds were blowing the Potomac’s water out to the Chesapeake Bay. The opposite happened during 2003’s Hurricane Isabel, resulting in much more severe flooding. "It really wasn't as bad as I thought it was going to be," one resident told News4. And a long-time resident of Alexandria said she's seen much more extreme flooding. "I've seen some pretty bad things," she said. "Lots of canoes going up and down Union Street, that kind of thing." D.C.'s damage was mild compared to the devestation along the Jersey Shore, in New York City and on Long Island. President Barack Obama declared a major disaster in New York City and Long Island, NBC4 New York reported, and authorities in New York say it may take weeks to repair the damage. Many parts of the city have seen intense flooding -- some at record levels, including the Battery area. Water flooded two major commuter tunnels, and Gov. Andrew Cuomo's office said at least five people have died in New York state because of the storm, the Associated Press reported. Both President Barack Obama and Republican nominee Mitt Romney canceled rallies scheduled for Monday, Tuesday and Wednesday due to the storm. Obama toured the storm-damaged parts of New Jersey with Jersey Gov. Chris Christie Wednesday. The Jersey Shore was devastated, with widespread damage in Atlantic City and Asbury Park. Parts of Ocean City in Maryland and Rehoboth Beach and Dewey Beach in Delaware -- three of the region's most popular coastal destinations -- were under water by Monday afternoon. Officials were predicting that Sandy would cause damage equal to or greater than two of the worst tropical storms in the region's history: Gloria in 1985 and Agnes in 1972. Authorities implored residents to stay off the roads while imposing evacuation orders that affected thousands of residents in low-lying coastal communities, primarily in Delaware. On Monday, wind-driven high tides swamped streets in Lewes east of the Lewes-Rehoboth canal, and police blocked a bridge over the canal. The wind and water toppled light poles near the Lightship Overfalls, a National Historic Landmark. Farther south in Dewey Beach, water from Rehoboth Bay innundated streets on the west side of Route 1, the major coastal highway, and crept onto the highway itself. Authorities blocked off Route 1 at the southern edge of town because of dune breaches farther south near the Indian River Inlet bridge, which also was closed. The stormy Atlantic Ocean covered the beach in Ocean City, where a pier was battered and badly damaged. 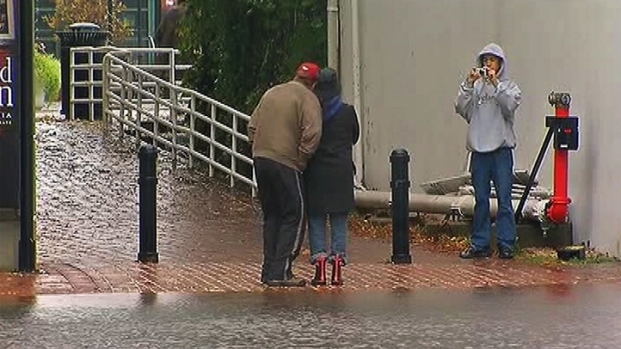 Mayor Rick Meehan said there was significant flooding in a downtown area where officials had ordered a mandatory evacuation. About 200 people were staying in the evacuated area. The high water and extent of the flooding surprised some. Ron Croker, the owner of Waterways Marina, was out in the rain Monday afternoon moving jet skis from a parking lot on Coastal Highway. Croker said he was surprised how high the water rose. On Chincoteague Island, with no shelters and no way to leave, emergency officials ordered a curfew at noon Monday as Sandy worsened, flooding streets and prompting several rescues. The Virginia Department of Transportation reopened the causeway Monday night as waters receded from the road but said it would continue to monitor water levels. Farther down the Virginia coast, there was tidal flooding in much of Hampton Roads, but the low-lying region had yet to receive the wallop expected from Sandy. Water was knee-high on some Norfolk streets and portions of major interstates, bridges and tunnels were impassible at times. There appeared to be little wind damage. Assateague Island, famed for the wild ponies that roam the dunes and scrub pine, also attracts tourists and birdwatchers -- but Monday, few visitors had remained on the island. Thomas Jones was among them. He was on business at NASA's Wallops Flight Facility, located up the causeway heading to the mainland. A resident of Fulton, N.Y., he said the storm didn't measure up to what he has battled at home most winters. 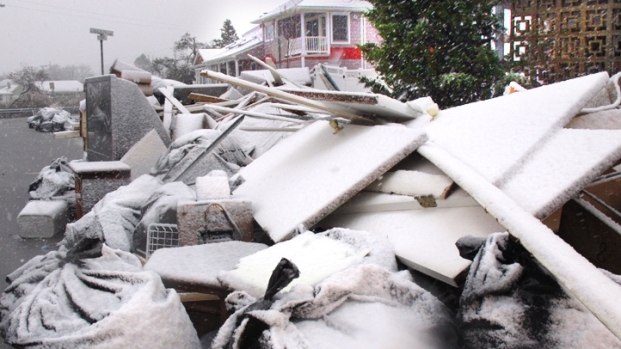 Sandy was a rare storm that started tropical and ended with blizzard warnings. Six inches of snow was reported in western Maryland, as well as coatings in southwestern Virginia and feet of snow in the mountains of West Virginia. Modified Amtrak service south from New York City was scheduled to resume Thursday night, half a day earlier than planned. However, Amtrak cautions riders that services to and from New York are subject to delays while repairs continue. Workers were "continuing to remove water from tunnels in order to make repairs to track, signal and power systems under the Hudson and East rivers and to restore service to and from Penn Station in New York City," Amtrak's website said Thursday morning. Plans to resume Northeast Regional service between New York and Boston, as well as modified Acela Express service, will be announced "later," Amtrak said. Limited service on south of New York City had resumed Wednesday, and service from Boston to New Haven, Conn., resumed early Thursday. CLICK HERE FOR the latest on travel disruptions. Metrorail and Metrobus opened 2 p.m. Tuesday on a limited schedule, and resumed regular service Wednesday. Capital Bikeshare also resumed service. D.C. and federal government offices reopened Wednesday, as did most schools. Although Arlington National Cemetery was closed to tourists during the storm, the Army's Third U.S. Infantry Regiment, known as The Old Guard, continued to stand guard over the Tomb of the Unknowns. Soldiers in combat uniforms were guarding the tomb from a small enclosure covered by a green awning about 20 feet away, said Maj. John Miller, a regiment spokesman.